Here’s a really quick post that will make you sweat just a little bit more in this summer heat. I’m going to be completely preoccupied at Tall Ships for the next five days on the waterfront (see you at the local wine & beer tent), so I won’t have any time for blogging. 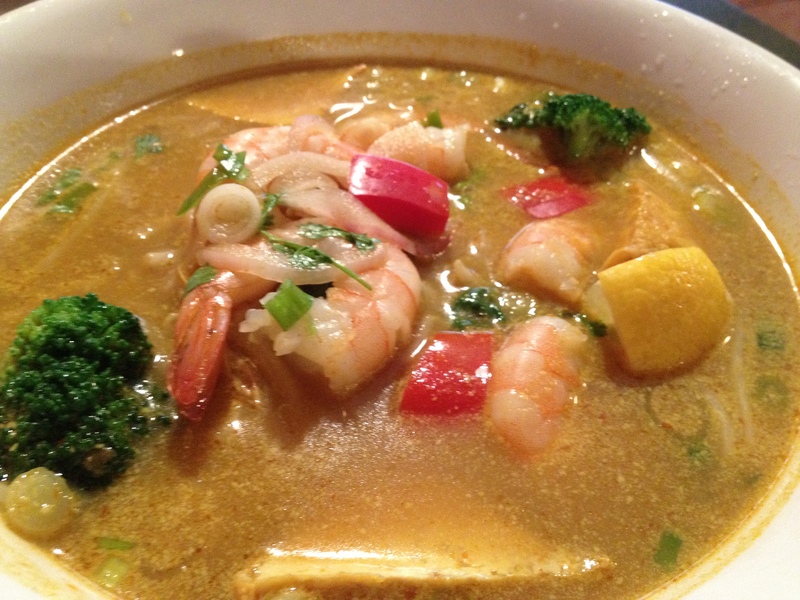 On Tuesday my sister and I went to Star Anise Vietnamese Noodles Restaurant, looking for a case of the noodle sweats. Now, I hadn’t been there in about four years, but I remembered that it was simple, authentic and delicious. It still is. The room is nothing fancy, but thankfully it was nicely air conditioned. After starting with a freshly deep-fried vegetable spring roll, I ordered the curry shrimp with noodles soup, which only had one chili pepper icon beside it. I could probably take more chili peppers, but this curry had just enough heat for me to feel it, without being uncomfortable. My sister ordered a barbecue beef pho, which had beautiful slices of nicely cooked beef in a magnificent looking broth. My noodle soup arrived in a gigantic bowl, as you can see from the above photo, with a piece of lemon, and lots of nicely sized shrimp. There were also vegetables, cooked perfectly (still a bit of crunch), and a pile of vermicelli rice noodles. It was so flavourful, and huge, that I couldn’t even finish my soup. We stuck with water, and we left paying about $15 each for a fantastic Tuesday night noodle fix. Also, service was friendly and quick. We were in and out in an hour. I’ll be going back! Yesterday, after work, we visited Halifax’s newest Napoli-style pizzeria, Piatto. This is, to my knowledge, the home of the third authentic wood-fired pizza oven that exists in the city. (The others being at Ristorante a Mano, and Morris East). Piatto Pizzeria & Enoteca, on the corner of Morris and Hollis, is the sister property to the Duckworth Street location in St. John’s, Newfoundland. The interior is modern industrial, with touches of European flare, like colourful Vespas parked in the restaurant, and an impressive-looking, overly shiny, manual espresso machine parked next to an Illy espresso bean grinder. The place looks gorgeous. I like the minimalist, clean style. It’s not trying to be Italian, necessarily, it’s trying to be modern and Western, while serving pizza and other Italian items as good as you’d find in Italy. Have they succeeded? You’ll have to read on to find out. We ordered a bottle of prosecco (no judgement please – yes it was a Monday), of which the name escapes me – maybe you can recognize by the side of the bottle. Piatto serves their wines, including bubbly, Italian-style in an unstemmed glass. The glass actually looked like a water glass, which I don’t mind at all. I ordered the Salvatore (pictured above). Although I was super excited they had an entire section of white pizzas – pizzas with an olive oil base – none were meatless, and besides, the Salvatore really caught my eye. 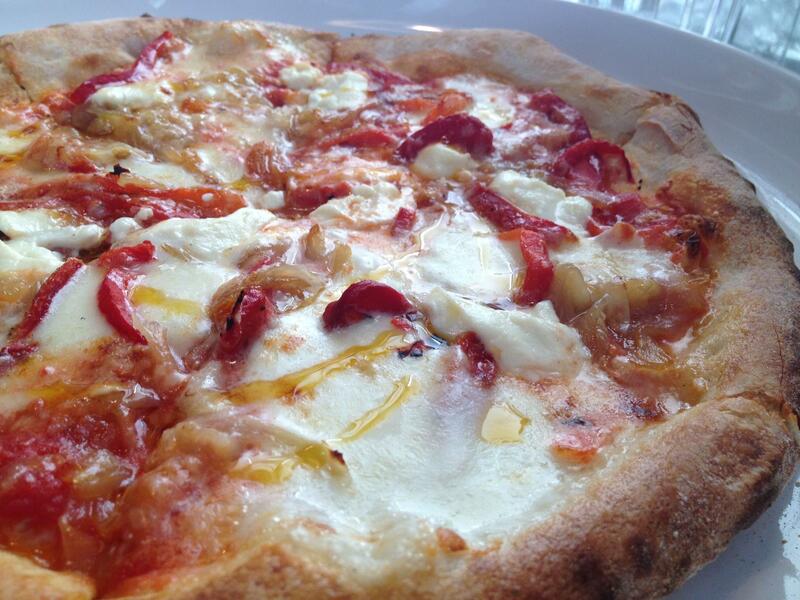 Fresh mozza, ricotta, roasted red peppers, garlic, caramelized onion and grana padano together equaled an amazing flavour profile in my mouth. Our waitress offered chili oil which was sourced from Liquid Gold. I appreciate the local focus, and also noticed both Garrison and Propellor on their beer menu. The only downfalls about the food were, if you want to be a food snob about it (and we are), the pizza probably had way too many ingredients to be truly Napoli-style, and, the cooks need a bit more training on the wood-fired pizza oven. The oven, which was truly a sight to be seen, stood in the corner of the restaurant, fully on display. It was beautiful. And looked insanely expensive. That’s why it’s too bad the guys using it gave me a pizza with a soggy crust in the middle, and a large, thick outer crust. Not exactly authentic. 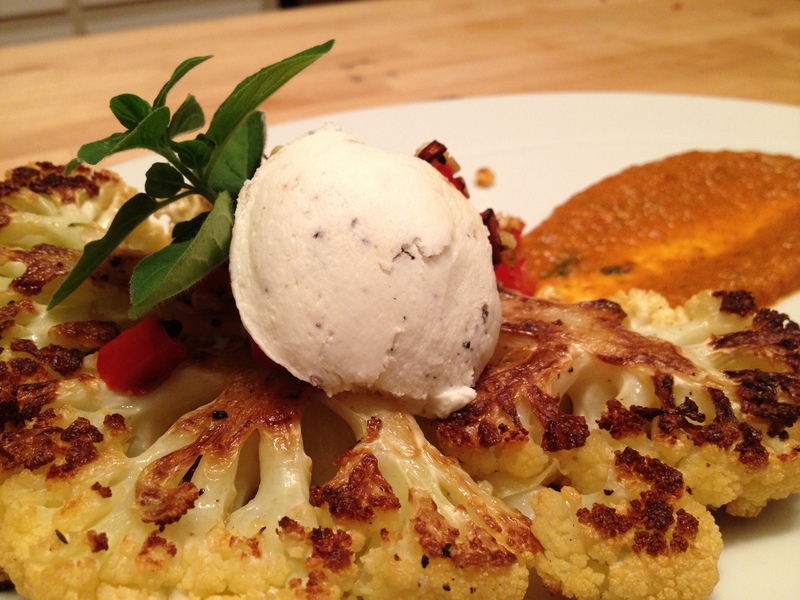 But like I said… the flavours were incredible. Points for that. My counterpart had a margherita pizza – his favourite – which was nice, but same problem with the crust. 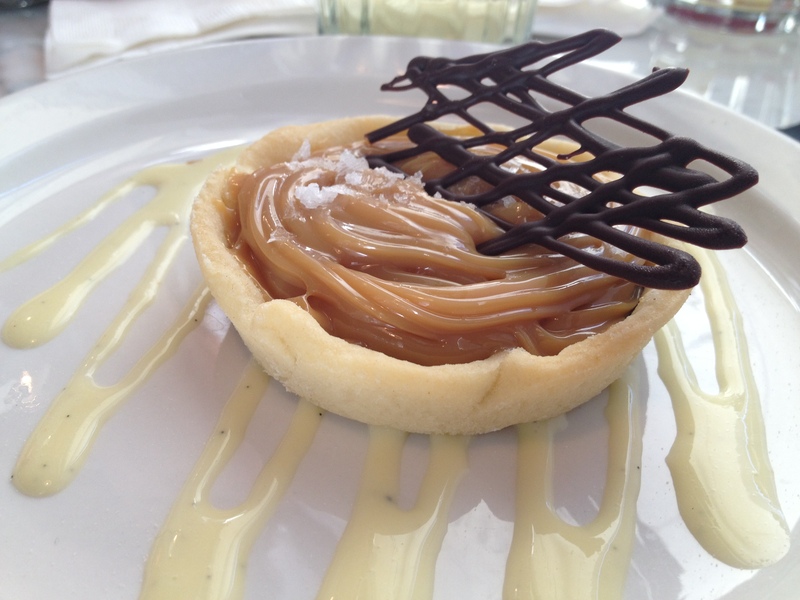 We shared a small dessert, the dulce de leche tart. This was enjoyable; there was a vanilla bean creme anglaise on the plate, the crust seemed homemade, the filling was beautifully thick and rich, plus there was flaked sea salt on top. I love a salty, savoury component to my dessert, so it really hit the spot. We even ordered a double espresso to share, at the end, just to make the waitress sweat… she’d been trained on the fancy machine but hadn’t had much practise. It was delish! This is a beautiful restaurant and service was very nice, but it’s not the best wood-fired pizza in Halifax. I’ll give them a few months to work out the kinks, and I’d definitely go back. It doesn’t get much more Canadian than heading into the woods with your camping gear, good friends, food and (lots of) drink. Check out the campfire cooking experiment by @eastchef that went incredibly right during our two-night trip to Dollar Lake Provincial Park this weekend. 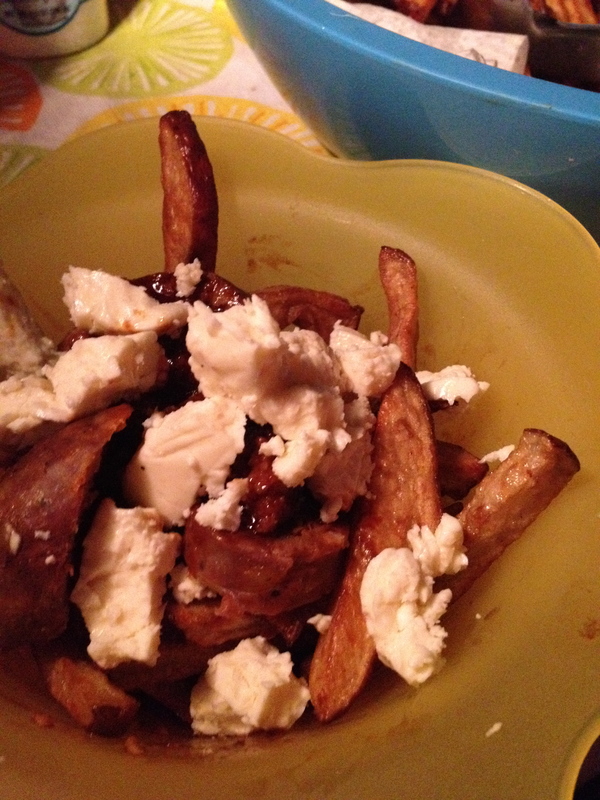 What says Canada more than sausage poutine… made on a campfire… in the middle of the woods? We had bangers from Meat Mongers (Getaway Farms), cheese curds from Fox Hill, local potatoes, and a delicious demi-glace to top it off.